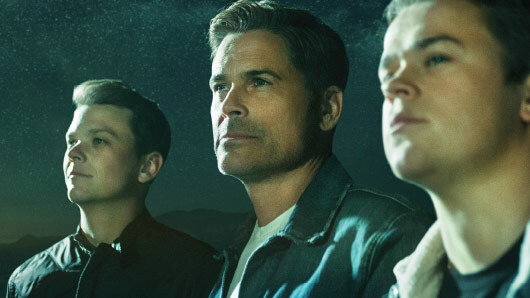 Rob Lowe has always been fascinated by unsolved mysteries ever since he was a young boy, and so of course felt it important to pass on his interest to his two sons, Matthew and John Owen. The Lowe Files sees the three family members delve deeper into the stories that captivate them as they travel the country in order to explore some of the biggest unsolved mysteries and spooky legends. The Lowe Files airs every Sunday at 10pm on HISTORY, with each episode following the trio as they unwrap and debate some of the country’s strangest occurrences. Throughout the series the boys visit a number of different locations, including an underwater alien base and an abandoned boys’ reformatory, where they meet with experts and engage in scientific investigations in order to uncover the truth behind these freaky tales. I’ll admit, I’m a bit of a sceptic when it comes to ghost-hunter style television shows, which are so often over-dramatised to the point where they just become completely unbelievable to me. The Lowe Files, however, surprised me in this regard. Rob and his two sons set off on their journey as a group of ghost story lovers, but ultimately cynics, aiming to find out whether the stuff we see on TV is a load of baloney; a premise I found much more engaging. As they turn up at each location, the trio question everything they are presented with and the two teenage boys are particularly quick to never take anything at face value. The dynamic between the father and sons is honestly magic. They are like a group of naughty school children, with the cheeky and charming Rob acting as ring leader. Some of the most entertaining moments occur when the three are simply on the way to their destination, teasing and bantering one another or making fun of their dad’s dodgy parking skills. And when you witness their intrigue as they begin delving into these spooky stories, you can’t help but join in with their excitement. It’s not all laughs and giggles, however. There are some seriously eerie moments as the three get up close and personal with their creepy surroundings and there are some inexplicable occurrences that even had me questioning how on earth they could have happened. Lovers of the supernatural will definitely get a kick out of this show, but that’s not to say non-believers won’t either. The investigations are engaging and thorough, and the fun spirited nature of the show is enough reason to give it a watch. Catch The Lowe Files every Sunday at 10pm on HISTORY.